The Navy Flag Display Case Shadow Box and Much More If you are looking for quality Navy Flag display cases, you have come to the right place. Flags Connections is proud to offer the finest products available online today. 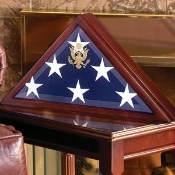 Whether you want to buy Navy Shadow boxes, Navy Frames, Navy Flag and medal display cases, Navy flag frames, Navy Flag Holders, Navy retirement gifts, Navy Veteran gift, Navy burial flag cases, Navy Memorial flag display cases, or Navy flag holders, look no further than Flag Connections. Recently retired or active Navy service members can proudly show off their honors with Navy Shadow Boxes. 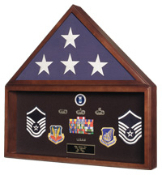 Display your medals, certificates, and photo’s in your home or office in a beautiful handcrafted wood Navy Shadow Box. Get Navy Frames from Flags Connections and show off your service in the United States Navy. Add a Navy Flag and medal display case and you will be the envy of your family and friends. 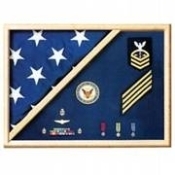 What better way to display your career than with Navy retirement Flag cases and Navy retirement Shadow boxes. You can even buy Navy flags for your garden. Buy a flagpole and proudly show off your service in the Navy. The 28”x40” United States Navy Decorative Banner includes the same emblem and banner as the official United States Navy flag. Another flag that was approved by former President Dwight D. Eisenhower, the US Navy flag is dark blue and displays and American Bald Eagle, an anchor and a ship flying the Commission Pennant. When you order the United States Navy Decorative Banner, do not forget to add the Banner Flag Pole to your shopping cart. Don’t let your Navy veteran retire without a party. Buy Navy retirement gifts from Flags Connections. 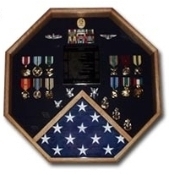 The Navy Flag Display Case Shadow Box is made from solid hardware and provides an excellent display for medals and rank insignia with a flag case triangle in the upper left hand corner that holds a 3’x5’ flag. If you do not own a flag, you can order one from Flags Connections. This Navy Flag Display Shadow Box was made exclusively and is the perfect place to house your US Navy flag. Choose from solid oak or walnut. The Navy display case has a laminate panel back with hanger and a crushed velvet background with a real glass front. Flags Connections is the only online flag superstore for all of your military needs. Stop shopping at inferior websites and buy American made. If you have always wanted a Navy flag, check out the huge range of polyester and cotton Navy flags available online. Once you buy from Flags Connections, you will never shop anywhere else. Navy Flag display cases, Navy Shadow boxes, Navy Frames, Navy Flag and medal display cases, Navy flag frames, Navy Flag Holders, Navy retirement gifts, Navy Veteran gift, Navy burial flag cases, Navy Memorial flag display cases, Navy flag holders are just a few of the hundreds of items that are available from Flags Connections. If you are looking for quality Navy Shadow boxes or Flag Frames start shopping today, and remember, military accounts are always welcome at Flags Connections. Navy Flag Display Cases Proudly Made In The USA Flags Connections has an incredible selection of Navy Flag display cases for you to choose from. You do not need a special occasion to honor those in service with a Navy Flag and medal display case. Order online and have a handcrafted Navy flag holder made for your father, grandfather, spouse or sister-in-law. Everyone who has served in the Navy deserves to be honored with Navy Shadow boxes displaying their awards, medals, and certificates. Save on the Navy Medallion Frame, Navy Photo, and Medallion Frame. This attractive 8” x 10” Medallion Picture Frame features a die-cast gold plated US Armed forces medallion that is centered to the right of a vertical 4” x 6” photo opening. The double matted solid mahogany colored wood frame is bevel cut and simply exquisite. 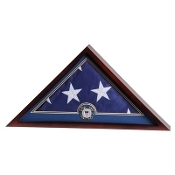 Honor a fallen hero with the Large Navy Flag Display Case. 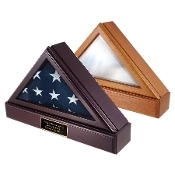 These Navy Memorial flag display cases are the perfect way to show the world how much you care. Large enough to display coffin sized flags, the Navy Flag display case is crafted out of walnut, solid oak, cherry, mahogany, or walnut. The double-strength glass front of the Navy flag case is laser engraved with the Navy emblem. The back panel of your Navy display case is layered with crushed velvet making this Navy flag case the best that you can buy today. 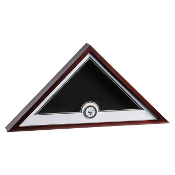 Order a Medal Display Case that compliments a Navy Flag case. Available in Cherry or Heirloom Walnut finishes, it opens from the back with a turn button closure and is very easy to mount. When a friend or family member decides to hang up his stripes, order Navy retirement gifts from Flags Connections. 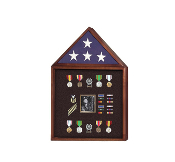 You can choose from Navy Shadow Boxes, Navy Veteran gifts and much more. Every gift that you buy for your retired vet is handcrafted in the United States and made from the finest quality materials. When you order your Navy retirement gifts why not add a United States Navy Car Flag to your shopping cart. Approved by President Dwight D. Eisenhower on April 24, 1959, this quality made United States Navy flag is dark blue and contains a slight variation of the U.S. Navy Seal. The picture displays an American Bald Eagle, an anchor and a ship flying the commission Pennant. The Navy Car Flag also features an American flag and the commodore’s flag. A yellow circular rope, and the title, “United States Navy”, surround the design. Get a Navy flag holder for a friend or family member who is about to be deployed, or buy a handcrafted Navy Flag and medal display case from Flags Connections. You will be amazed at how many quality products are available online. Choose from hundreds of Navy retirement gifts, Navy Veteran gifts, and Navy Shadow Boxes. Show everyone who has ever been in the armed services how much you appreciate what they have done for you, and everyone in the country, and present him or her with a Navy Shadow Box that is filled with medals, certificates, and of course, the US Flag.